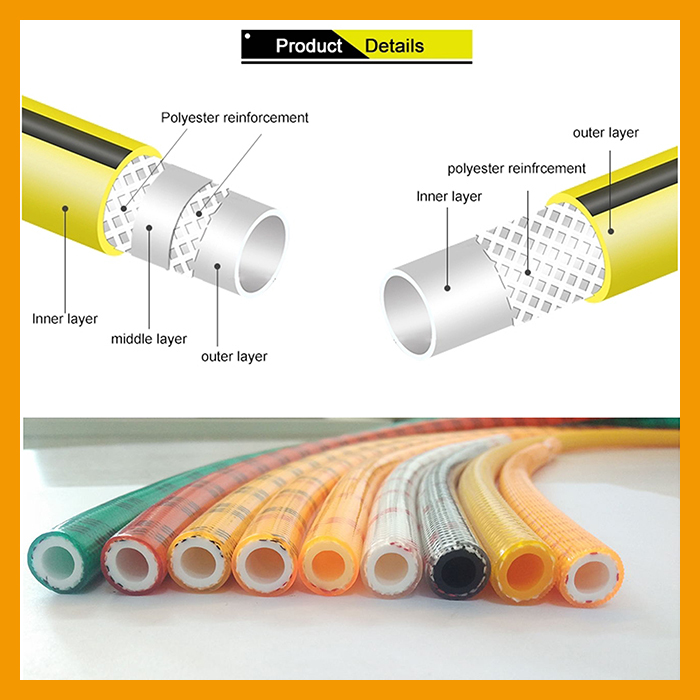 Product categories of Transparent High Pressure Spray Hose, we are specialized manufacturers from China, Pvc Braided Hose, Agricultural Delivery Hose suppliers/factory, wholesale high-quality products of Pvc Braided Power Spray Hose R & D and manufacturing, we have the perfect after-sales service and technical support. Look forward to your cooperation! Transparent High Pressure Spray Hose the use of highly ductile materials, exceptionally strong adhesive, the middle layer of polyester braid line, it can withstand high pressure, flexibility, light weight, resistance to bending, the surface brightness, Abrasion, weathering, oil, acid and alkali.The burst pressure of our Pvc Braided Hose is 160-200kg and the temperature is -5℃-65℃.Non toxic,coloful and nice apperance.Our Agricultural Delivery Hose is package by PVC film and carton,very strong and ensure the safety of our customer goods.Besides,we can print your logo on the hose and carton. Copyright © 2019 Zhanjiang QITAI Industry & Trading Co., Ltd. All rights reserved.